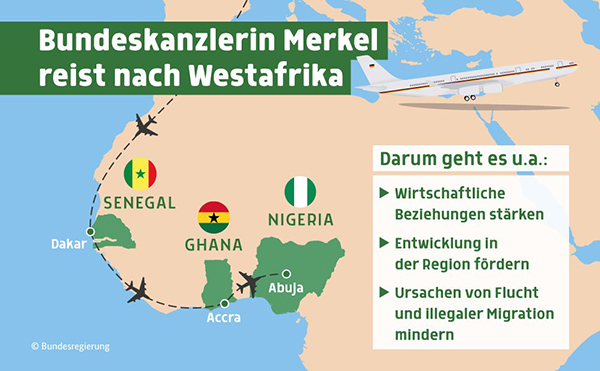 Business and migration were the key topics of German Chancellor Angela Merkel’s three-day tour of West Africa from 29-31 August. Merkel was accompanied by a high-level business delegation to promote business ties and private sector investment, in line with the objectives of the G20 Compact with Africa that was initiated in June 2017. Her visit started off in Senegal on 29 August where she met with President Macky Sall. In Senegal, Germany is mainly active in the renewable energy and energy efficiency fields. However, the overall volume of German investments in Senegal remains weak (17 million euros in 2016). In Ghana, Chancellor Merkel met with President Nana Akufo-Addo. They took stock of the new bilateral investment and reform partnership that was launched in December 2017. Ghana and Germany are also jointly organising the German African Business Summit (GABS), to be held in Accra from 11‑13 February 2019. Talks in Nigeria focused on economic co-operation, but also on how to cope the wave of migration from the continent to Europe. In July, nearly 950 Nigerians applied for asylum in Germany. “Youth are demanding and want a future in their own country […] The economic outlook is crucial for most of the African countries because there are so many young people who need jobs and training,” Merkel said in her video podcast. Chancellor Merkel also met with ECOWAS Commission President Jean-Claude Kassi Brou to promote “strong investment and business relations between [the] German private sector and the ECOWAS region.” On the side-lines of Merkel’s three-day visit, the German company Volkswagen signed two memorandums of understanding with Ghana and Nigeria. Volkswagen committed to setting up a vehicle assembly plant and conducting a feasibility study for the development of an integrated mobility solution. Together with Ethiopia, Kenya and Rwanda, the two countries are part of Volkswagen’s new pilot initiatives aimed at increasing investments on the African continent.